The Gujarati people or Gujaratis (Gujarati: ગુજરાતી) are an ethnic group traditionally from Gujarat that speak Gujarati, an Indo-Aryan language. Gujaratis are prominent in entrepreneurship and business enterprise, and key figures played a historic role in the introduction of the doctrine of Swaraj and the Indian independence movement in British-ruled India. Despite significant migration primarily for economic reasons, most Gujaratis in India live in the state of Gujarat in Western India. Gujaratis also form a significant part of the populations in the neighboring metropolis of Mumbai and union territories of Daman and Diu, and Dadra Nagar Haveli, both being former Portuguese colonies. There are very large Gujarati immigrant communities in other parts of India, most notably in Mumbai, Delhi, Calcutta, Madras, Bangalore and other metropolitan areas like Kollam and Kochi in Kerala. All throughout history Gujaratis have earned a reputation as being India's greatest merchants,industrialists and business entrepreneurs, and have therefore been at forefront of migrations all over the world, particularly to regions that were part of the British empire such as Fiji, Hong Kong, New Zealand, East Africa and countries in Southern Africa. Diasporas and transnational networks in many of these countries date back to more than a century. In recent decades, larger numbers of Gujaratis have migrated to English speaking countries such as the United Kingdom, Australia, Canada and the United States. An outbreak of bubonic plague in 1812 has been claimed to have killed about half the Gujarati population. Orthodox Gujarati society which was mercantile by nature, was historically organized along ethno-religious lines and shaped into existence on the strength of its Mahajan ("guild assemblies"), and for its institution of Nagarsheth ("head of the guild assembly"); a 16th-century Mughal system akin to medieval European guilds which self-regulated the mercantile affairs of multi-ethnic, multi-religious communities in the Gujarati bourgeoisie long before municipal state politics was introduced. Historically, Gujaratis belonging to numerous faiths and castes, thrived in an inclusive climate surcharged by a degree of cultural syncretism, in which Hindus and Jains dominated occupations such as shroffs and brokers whereas, Muslims, Hindus and Parsis largely dominated sea shipping trade. This led to religious interdependence, tolerance, assimilation and community cohesion ultimately becoming the hallmark of modern-day Gujarati society. The major communities in Gujarat are the traditional Agriculturalist such as Patel, Ahir, Bharvad, and Rabari, Artisan communities (Gurjar, Prajapati, Sindhi Mochi), Brahmin communities (such as Joshi, Anavil, Nagar, Modh), Farming communities (such as Choudhary Jats and Koli people, Genealogist communities (such as Charans and Barots), Kshatriya communities (such as Koli Thakor, Banushali, Kathi Darbars, Karadia, Nadoda, Dabhi, Chudasama, Maher), Parsi Community, Tribal communities (such as Bhils, Meghwal and Kolis) and Vaishya (such as Bhatia, Lohana, Soni). The major Gujarati Muslim communities include Nizari Ismailis, Bhadala, Daudi Bohra, Memon, Khoja, Sayyid, Siddhi and Vahora. Gujaratis have a long tradition of seafaring and a history of overseas migration to foreign lands, to Yemen Oman Bahrain, Kuwait, Zanzibar and other countries in the Persian Gulf since a mercantile culture resulted naturally from the state's proximity to the Arabian Sea. The countries with the largest Gujarati populations are Pakistan, United Kingdom, United States, Canada and many countries in Southern and East Africa. Globally, Gujaratis are estimated to comprise around 33% of the Indian diaspora worldwide and can be found in 129 of 190 countries listed as sovereign nations by the United Nations. Non Resident Gujaratis (NRGs) maintain active links with the homeland in the form of business, remittance, philanthropy, and through their political contribution to state governed domestic affairs. There is a community of Gujarati Muslims mainly settled in the Pakistani province of Sindh for generations. Community leaders say there are 3,000,000 speakers of Gujarati language in Karachi. A sizable number migrated after the Partition of India and subsequent creation of independent Pakistan in 1947. These Pakistani Gujaratis belong mainly to the Ismāʿīlī, Khoja, Dawoodi Bohra, Chundrigar, Charotar Sunni Vohra, Muslim Kutchi, Muslim Khatri and Memon groups; however, many Gujaratis are also a part of Pakistan's small but vibrant Hindu community. Famous Gujaratis of Pakistan include Muhammed Ali Jinnah (father of Pakistan), Ibrahim Ismail Chundrigar (sixth Prime Minister of Pakistan), Sir Adamjee Haji Dawood (philanthropist), Abu Bakr Osman Mitha (Major-General), Abdul Razzak Yaqoob (philanthropist), Javed Miandad (Pakistani cricketer), Abdul Sattar Edhi (humanitarian), Jehangir H. Kothari (philanthropist), Abdul Gaffar Billoo (philanthropist), Sarfraz Ahmed(Pakistani cricketer), Ramzan Chhipa (philanthropist), Tapu Javeri (Pakistani fashion and art photographer), Pervez Hoodbhoy (Pakistani nuclear physicist) and Ardeshir Cowasjee (Pakistani critic and social activist). Gujaratis have achieved a high demographic profile in many urban districts worldwide, notably in India Square, Bombay, in Jersey City, New Jersey, USA, within the New York City Metropolitan Area, as large-scale immigration from India continues into New York, with the largest metropolitan Gujarati population outside of India. The United States has the second-largest Gujarati diaspora after Pakistan. The highest concentration of the population of over 100,000 is in the New York City Metropolitan Area alone, notably in the growing Gujarati diasporic center of India Square in Jersey City, New Jersey, and Edison in Middlesex County in Central New Jersey. Significant immigration from India to the United States started after the landmark Immigration and Nationality Act of 1965. Early immigrants after 1965 were highly educated professionals. Since US immigration laws allow sponsoring immigration of parents, children and particularly siblings on the basis of family reunion, the numbers rapidly swelled in a phenomenon known as "chain migration". A number of Gujarati are twice or thrice-migrant because they came directly from the former British colonies of East Africa or from East Africa via Great Britain respectively Given the Gujarati propensity for business enterprise, a number of them opened shops and motels. Now in the 21st century over 40% of the hospitality industry in the United States is controlled by Gujaratis. Gujaratis, especially the Patidar samaj, also dominate as franchisees of fast food restaurant chains such as Subway and Dunkin' Donuts. The descendants of the Gujarati immigrant generation have also made high levels of advancement into professional fields, including as physicians, engineers and politicians. In August 2016, Air India commenced single aircraft (no transfer) flight service between Ahmedabad and Newark Liberty International Airport in New Jersey, via London Heathrow International Airport. Notable Gujarati Americans include Ami Bera (United States Congress), Reshma Saujani (American politician), Sonal Shah (economist to Whitehouse), Raj Shah (White House Deputy Press Secretary under President Trump), Rohit Vyas (Indian American journalist), Bharat Desai (CEO Syntel), Vyomesh Joshi (Forbes), Romesh Wadhwani (Forbes), Raj Bhavsar (sports) Halim Dhanidina (first Muslim judge of California), Savan Kotecha (Grammy nominated American songwriter), and Hollywood actresses, Sheetal Sheth and Noureen DeWulf. Gujaratis have had a long involvement with Britain. The original East India Company set up a factory (trading post) in the port city of Surat in Gujarat in 1615. These were the beginnings of first real British involvement with India that eventually led to the formation of the British Raj. The third largest overseas diaspora of Gujaratis, after Pakistan and United States, is in the UK. At a population of around 600,000 Gujaratis form almost half of the Indian community who live in the UK (1.2 million). Gujaratis first went to the UK in the 19th century with the establishment of the British Raj in India. Prominent members of this community such as Shyamji Krishna Varma played a vital role in exerting political pressure upon colonial powers during the Indian independence movement. The present day Gujarati diaspora in the UK is mostly the second and third generation descendants of "twice-over" immigrants from the former British colonies of East Africa, Portugal, and Indian Ocean Islands. Most of them despite being British Subjects had restricted access to Britain after successive Immigration acts of 1962, 1968 and 1971. Most were, however, eventually admitted on the basis of a Quota voucher system or, in case of Uganda, as refugees after the expulsion order by the Ugandan ruler, Idi Amin in August 1972. Gujaratis in Britain are regarded as affluent middle-class peoples who have assimilated into the milieu of British society. They are celebrated for revolutionizing the corner shop, and energising the British economy which changed Britain's antiquated retail laws forever. Demographically, Hindus form a majority along with a significant number of Jains and Muslims, and smaller numbers of Gujarati Christians. They are predominantly settled in metropolitan areas like Greater London, East Midlands, West Midlands, Lancashire and Yorkshire. Cities with significant Gujarati populations include Leicester and London boroughs of Brent, Barnet, Harrow and Wembley. There is also a small, but vibrant Gujarati-speaking Parsi community of Zoroastrians present in the country, dating back to the bygone era of Dadabhai Navroji, Shapurji Saklatvala and Pherozeshah Mehta. Both Hindus and Muslims have established caste or community associations, temples, and mosques to cater for the needs of their respective communities. 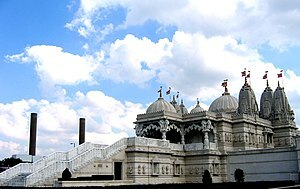 A well known temple popular with Gujaratis is the BAPS Swaminarayan Temple in Neasdon, London. A popular mosque that caters for the Gujarati Muslim community in Leicester is the Masjid Umar. Leicester has a Jain Temple that is also the headquarters of Jain Samaj Europe. The Shree Prajapati Association is a charity, already thriving in East Africa, which has 13 branches in the U.K. and is strongly dependent on support from the Gujarati community in Britain. Endogamy remains important to Gujarati Muslims in UK with the existence of matrimonial services specifically dedicated to their community. Gujarati Muslim society in the UK have kept the custom of Jamat Bandi, literally meaning communal solidarity. This system is the traditional expression of communal solidarity. It is designed to regulate the affairs of the community and apply sanctions against infractions of the communal code. Gujarati Muslim communities, such as the Ismāʿīlī, Khoja, Dawoodi Bohra, Sunni Bohra, and Memon have caste associations, known as jamats that run mosques and community centers for their respective communities. India becoming the predominant IT powerhouse in the 1990s has led to waves of new immigration by Gujaratis, and other Indians with software skills to the UK. In 2005, the Gujarat Studies Association was formed in order to raise awareness about research being conducted on the Gujaratis - their patron is Lord Bhikhu Parekh. Two Gujarati business communities, the Palanpuri Jains and the Kathiawadi Patels from Surat, have come to dominate the diamond industry of Belgium. They have largely displaced the Orthodox Jewish community which previously dominated this industry in Belgium. Canada, just like its southern neighbour, is home to a large Gujarati community. According to the 2016 census, there are 122,460 Gujaratis of various religious backgrounds living in Canada. The majority of them live in Toronto and its suburbs - home to the second largest Gujarati community in North America, after the New York Metropolitan Area. 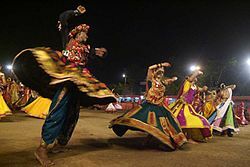 Gujarati Hindus are the second largest linguistic/religious group in Canada's Indian community after Punjabi Sikhs, and Toronto is home to the largest Navratri raas garba festival in North America. The Ismaili Khoja form a significant part of the Canadian diaspora estimated to be about 80,000 in numbers overall. Most of them arrived in Canada in the 1970s as immigrants from Uganda and other countries of East Africa. Notable Gujarati Canadians include Bharat Masrani (CEO of TD Bank Group), Zain Verjee (CNN journalist), Ali Velshi (former CNN, current MSNBC journalist), Rizwan Manji (Canadian actor), Avan Jogia (Canadian actor[circular reference]), Richie Mehta (Canadian film director), Nazneen Contractor (Canadian actress), Ishu Patel (BAFTA-winning Animations director), Arif Virani (Member of Parliament for Parkdale-High Park), Rahim Jaffer (Member of Parliament for Edmonton-Strathcona), Naheed Nenshi (36th Mayor of Calgary), Omar Sachedina (CTV News anchor) and Prashant Pathak (Investor and Philanthropist). Former British colonies in East Africa had many residents of South Asian descent. The primary immigration was mainly from Gujarat and to a lesser extent from Punjab. They were brought there by the British Empire from India to do clerical work in Imperial service, or unskilled and semi-skilled manual labour such as construction or farm work. In the 1890s, 32,000 labourers from British India were brought to the then British East African colonies under indentured labour contracts to work on the construction of the Uganda Railway that started in the Kenyan port city of Mombasa and ended in Kisumu on Kenyan side of Lake Victoria. Most of the surviving Indians returned home, but 6,724 individuals decided to remain in the African Great Lakes after the line's completion. Gujarati and other Indians started moving to the Kenya colony at the end of the 19th century when the British colonial authorities started opening up the country with the laying down of the railroads. A small colony of merchants, however, had existed on the port cities such Mombasa on the Kenyan coast for hundreds of years prior to that. The immigrants who arrived with the British were the first ones to open up businesses in rural Kenya a century ago. These Dukawalas or shopkeepers were mainly Gujarati (Mostly Jains and Hindus and a minority of Muslims). Over the following decades the population, mainly Gujarati but also a sizable number of Punjabi, increased in size. The population started declining after the independence of Kenya in the 1960s. At that time the majority of Gujaratis opted for British citizenship and eventually moved there, especially to cities like Leicester or London suburbs. Famous Kenyans of Gujarati heritage who contributed greatly to the development of East Africa include Thakkar Bapa, Manu Chandaria, Atul Shah, Baloobhai Patel, Bhimji Depar Shah (Forbes), Naushad Merali (Forbes), and Indian philanthropist, Alibhai Mulla Jeevanjee, who played a large role in the development of modern-day Kenya during colonial rule. There is a small community of people of Indian origin living in Uganda, but the community is far smaller than before 1972 when Ugandan ruler Idi Amin expelled most Asians, including Gujaratis. In the late 19th century, mostly Sikhs, were brought on three-year contracts, with the aid of Imperial British contractor Alibhai Mulla Jeevanjee to build the Uganda Railway from Mombasa to Kisumu by 1901, and to Kampala by 1931. Some died, while others returned to India after the end of their contracts, but few chose to stay. They were joined by Gujarati traders called "passenger Indians", both Hindu and Muslim free migrants who came to serve the economic needs of the indentured labourers, and to capitalise on the economic opportunities. After the 1972 expulsion, most Indians and Gujaratis migrated to the United Kingdom. Due to the efforts of the Aga Khan, many Khoja Nizari Ismaili refugees from Uganda were offered asylum in Canada. Indians have a long history in Tanzania starting with the arrival of Gujarati traders in the 19th century. There are currently over 50,000 people of Indian origin in Tanzania. Many of them are traders and they control a sizeable portion of the Tanzanian economy. They came to gradually control the trade in Zanzibar. Many of the buildings constructed then still remain in Stone Town, the focal trading point on the island. Amla training with South Africa in 2009. The Indian community in South Africa is more than a 150 years old and is concentrated in and around the city of Durban. The vast majority of immigrant pioneer Gujaratis who came in the latter half of the 19th century were passenger Indians who paid for their own travel fare and means of transport to arrive and settle South Africa, in pursuit of fresh trade and career opportunities and as such were treated as British subjects, unlike the fate of a class of Indian indentured laborours who were transported to work on the sugarcane plantations of Natal Colony in dire conditions. Passenger Indians, who initially operated in Durban, expanded inland, to the South African Republic (Transvaal), establishing communities in settlements on the main road between Johannesburg and Durban. After wealthy Gujarati Muslim merchants began experiencing discrimination from repressive colonial legislation in Natal, they sought the help of one young lawyer, Mahatma Gandhi to represent the case of a Memon businessman. Umar Hajee Ahmed Jhaveri was consequently elected the first president of the South African Indian Congress. Indians in South Africa could traditionally be bifurcated as either indentured labourers (largely from Tamil Nadu, with smaller amounts from UP and Bihar) and merchants (exclusively from Gujarat). Indians have played an important role in the anti-apartheid movement of South Africa. Many were incarcerated alongside Nelson Mandela following the Rivonia Trial, and many became martyred fighting to end racial discrimination. Notable South African Indians of Gujarati heritage include Marxist freedom fighters such as Ahmed Timol (activist), Yusuf Dadoo (activist), Ahmed Kathrada (activist), Amina Cachalia (activist) and Dullah Omar (activist), as well as Ahmed Deedat (missionary), Imran Garda (Al Jazeera English) and Hashim Amla (cricketer). Oman, holding a strategically important position at the mouth of the Persian Gulf, has been the primary focus of trade and commerce for medieval Gujarati merchants for much of its glorious history and Gujaratis, along with various other ethnic groups, contributed to the rich dynamic culture, founding and settlement of its capital port city, Muscat. Some of the earliest Indian immigrants to settle in Oman were the Bhatias of Kutch, who have a powerful presence in Oman dating back to the 16th century. At the turn of the 19th century, Gujaratis wielded such immense political clout that Faisal bin Turki, the great-grandfather of the current ruler, spoke Gujarati and Swahili along with his native Arabic and Oman's sultan Syed Said (1791-1856) was persuaded to shift his capital from Muscat to Zanzibar, more than two thousand miles from the Arabian mainland, on the recommendation of Shivji Topan and Bhimji families who lent money to the Sultan. In modern times, business tycoon Kanaksi Khimji, from the famous Khimji family of Gujarat was conferred title of Sheikh by the Sultan, the first ever use of the title for a member of the Hindu community. The Muscati Mahajan is one of the oldest merchants associations founded more than a century ago. Gujaratis had a flourishing trade with Southeast Asia in the 15th and 16th centuries, and played a pivotal role in establishing Islam in the region. Miller (2010) presented a theory that the indigenous scripts of Sumatra (Indonesia), Sulawesi (Indonesia) and the Philippines are descended from an early form of the Gujarati script. Tomé Pires reported a presence of a thousand Gujaratis in Malacca (Malaysia) prior to 1512.Gujarati language continues to be spoken in Singapore and Malaysia. Gujarati food has famously been described as "the haute cuisine of vegetarianism" and meals have a subtle balance of sweet, tart and mild hot sensations on the palate. Gujarati Jains, many Hindus and Buddhist in Gujarat are vegetarian. However, many Gujaratis such as Hindu Rajputs, Christians, and Muslims have traditionally eaten a variety of meats and seafood, although Muslims don't eat pork and Hindus don't eat beef. Gujarati cuisine follows the traditional Indian full meal structure of rice, cooked vegetables, lentil dal or curry and roti. 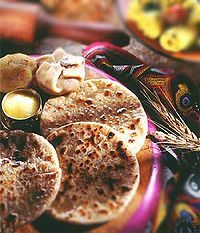 The different types of flatbreads that a Gujarati cooks are rotli or chapati, bhakhri, thepla or dhebara, puri, maal purah, and puran-pohli. Popular snacks such as Khaman, Dhokla, Pani Puri, Dhokli, dal-dhokli, Undhiyu, Jalebi, fafda, chevdoh, Samosa, papri chaat, Muthia, Bhajia, Patra, bhusu, locho, sev usal, fafda gathiya, vanela gathiya and Sev mamra are traditional Gujarati dishes savoured by many communities across the world. Khichdi – a mix of rice and mung dal, cooked with spice – is a popular and nutritious dish which has regional variations. Quite often the khichdi is accompanied by Kadhi. It is found satisfying by most Gujaratis, and cooked very regularly in most homes, typically on a busy day due to its ease of cooking. It can also become an elaborate meal such as a thali when served with several other side dishes such as a vegetable curry, yogurt, sabzi shaak, onions, mango pickle and papad. Surti delicasies include ghari which is a puri filled with khoa and nuts that is typically eaten during the festival Chandani Padva. Khambhat delicacies include famous sutarfeni – made from fine strands of sweet dough (rice or maida) garnished with pistachios, and halwasan which are hard squares made from broken wheat, khoa, nutmeg and pistachios. A version of English custard is made in Gujarat that uses cornstarch instead of the traditional eggs. It is cooked with cardamom and saffron, and served with fruit and sliced almonds. Gujarati families celebrate Sharad Purnima by having dinner with doodh-pauva under moonlight. The history of Gujarati literature may be traced to 1000 AD. Since then literature has flourished till date. Well known laureates of Gujarati literature are Jhaverchand Meghani, Avinash Vyas, Hemchandracharya, Narsinh Mehta, Gulabdas Broker, Akho, Premanand Bhatt, Shamal Bhatt, Dayaram, Dalpatram, Narmad, Govardhanram Tripathi, Mahatma Gandhi, K. M. Munshi, Umashankar Joshi, Suresh Joshi, Pannalal Patel, Imamuddin khanji Babi Saheb (Ruswa mazlumi), Niranjan Bhagat, Rajendra Keshavlal Shah, Raghuveer Chaudhari and Sitanshu Yashaschandra Mehta. Kavi Kant, Kalapi and Abbas Abdulali Vasi are Gujarati language poets. Ardeshar Khabardar, Gujarati-speaking Parsi who was president of Gujarati Sahitya Parishad was a nationalist poet. His poem, Jya Jya Vase Ek Gujarati, Tya Tya Sadakal Gujarat (Wherever a Gujarati resides, there forever is Gujarat) depicts Gujarati ethnic pride and is widely popular in Gujarat. Gujarat Vidhya Sabha, Gujarat Sahitya Sabha, and Gujarati Sahitya Parishad are Ahmedabad based literary institutions promoting the spread of Gujarati literature. Saraswatichandra is a novel by Govardhanram Tripathi. 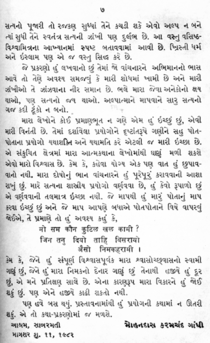 Writers like Harindra Dave, Suresh Dalal, Jyotindra Dave, Dinkar Joshi, Prahlad Brahmbhatt, Tarak Mehta, Harkisan Mehta, Chandrakant Bakshi, Vinod Bhatt, Kanti Bhatt, Makarand Dave, and Varsha Adalja have influenced Gujarati thinkers. Swaminarayan paramhanso, like Bramhanand, Premanand, contributed to Gujarati language literature with prose like Vachanamrut and poetry in the form of bhajans. Kanji Swami a spiritual mystic who was honored with the title, 'Koh-i-noor of Kathiawar' made literary contributions to Jain philosophy and promoted Ratnatraya. Gujarati theatre owes a lot to bhavai. Bhavai is a musical performance of stage plays. Ketan Mehta and Sanjay Leela Bhansali explored artistic use of bhavai in films such as Bhavni Bhavai, Oh Darling! Yeh Hai India and Hum Dil De Chuke Sanam. Dayro (gathering) involves singing and conversation reflecting on human nature. Gujarati language is enriched by the Adhyatmik literature written by the Jain scholar, Shrimad Rajchandra and Pandit Himmatlal Jethalal Shah. This literature is both in the form of poetry and prose. Folklores are important part of Gujarati culture. The folktales of Kankavati are religious in nature because they sprung from the ordinary day-to-day human cycle of life independent of, and sometimes deviating from the scriptures. They are part of the Hindu rituals and practices for marriage, baby shower , naming ceremony, the harvest and death, and are not merely religious acts but they reflect the lived life of people in rural and urban societies.The anthologies of Dadaji Ni Vato and Raang Chhe Barot are pragmatic with practical and the esoteric wisdom. Saurashtra Ni Rasdhar is a collection of love legends and depicts every shade of love and love is the main emotion which makes human world beautiful because it calls forth patience, responsibility, sense of commitment and dedication.Also the study of Meghani‘s works is quintessential because he was a trailblazer in exploring the vast unexplored heritage of Gujarati folklore. His folktales mirrors milieu of Gujarat, dialects, duhas, decors, humane values, sense of sacrifice and spirit of adventure, enthusiasm and, of course, the flaws in people. Meghani‘s folktales are verbal miniature of Gujarati culture. Some of the most important figures involved in the independence movement were Gujarati. 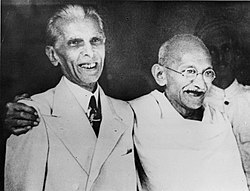 These include Mahatma Gandhi, Sardar Patel, and father of Pakistan Muhammad Ali Jinnah. Gujaratis have also been prime ministers of India. They include Morarji Desai, and the current prime minister Narendra Modi. Others involved in Gujarat or Indian National politics include current former chief minister Anandiben Patel, Rajesh Chudasama, Shaktisinh Gohil, Vitthal Radadiya, Vasanbhai Ahir, Purshottam Solanki, Prabhatsinh Pratapsinh Chauhan, Poonamben Madam, Asifa Khan, Vijay Rupani, Dileep Sanghani, Jayantilal Bhanusali, Arjun Modhwadia, Kandhal Jadeja and Shankar Chaudhary. There have been many Gujaratis involved in Pakistani politics, with the most prominent individuals being stateswoman and leading founder of Pakistan, Fatima Jinnah; the sixth Prime Minister of Pakistan, I.I. Chundrigar; and the current Deputy Chairman of the Senate of Pakistan, Saleem Mandviwalla. Other important Pakistani-Gujarati politicians include Mahmoud Haroon, Hussain Haroon, Muhammad Dilawar Khanji, Zubeida Rahimtoola, Ashraf W. Tabani, Arshad Vohra, Habib Rahimtoola, and Abdul Qadir Patel, as well as many others.. UK politicians of Gujarati descent include Baron Desai, Baron Popat, Baron Verjee, Baron Dholakia, Baron Parekh, Shailesh Vara, and Priti Patel, among others as well as Canadian politician Arif Virani. Vikram Sarabhai, Shrimad Rajchandra, Swami Dayanand Saraswati, Gopaldas Ambaidas Desai, Ashoka Mehta, Indulal Yagnik, Sanat Mehta, Ravi Shankar Vyas, Jhaverchand Meghani, Abbas Tyabji, Mahadev Desai, Jayanti Dalal, K.M. Munshi, Jugatram Dave, Odhavram, Shyamji Krishna Varma, and S. R. Rana. Famous Bollywood veterans of Gujarati heritage include Sohrab Modi, Asha Parekh, Sanjeev Kumar, Jackie Shroff, Parveen Babi,Aditya Pancholi, Dimple Kapadia, Tina Ambani, Farooq Sheikh, Manmohan Panchamiya and Mehtab. Mehboob Khan was a pioneer of Hindi cinema, best known for directing the social epic drama Mother India (1957). As well as film directors such as Mehul Kumar, Mahesh Bhatt and Shreedatt Vyas Anees Bazmee ,Indian theatre personalities include Boman Irani, and Alyque Padamsee. Award-winning producer Ismail Merchant, won six Academy Awards in collaboration with Merchant Ivory Productions, whereas veteran playback singer Jaykar Bhojak has been performing in the industry for over two decades now. Bollywood actresses Prachi Desai and Ameesha Patel have found fame in recent times. Manmohan Desai is remembered for casting actors like Raj Kapoor, Babita and Amitabh Bachchan in hit films he directed such as Chhalia, Kismat, and Amar Akbar Anthony, and Babubhai Mistry pioneered the use of special effects in films. Theatre veteran Chhel Vayeda was well known in Hindi cinema for being a popular production designer who designed the sets of over 50 films during his lifetime. Meanwhile, film tycoon Dalsukh Pancholi owned and operated one of the biggest cinema houses in Lahore and launched the careers of Punjabi film stars such as Noor Jehan in undivided India.Wadia Movietone was a noted Indian film production company and studio based in Mumbai, established in 1933 by Wadia brothers J. B. H. Wadia and Homi Wadia, whom were originally Parsis from Surat. Director Chaturbhuj Doshi is today known as was one of the founding fathers of Gujarati cinema. Gujarati films have made artists like Naresh Kanodia, Upendra Trivedi, Snehlata, Raajeev, Roma Maneck, Aruna Irani and Asrani popular in the entertainment industry. Among these dynamic actors, the late Upendra Trivedi who was a leading veteran of Gujarati cinema, made a popular pair with the heroine Snehlata and together they co-acted in more than 70 Gujarati films. Arvind Trivedi by whom the famous character of Ravana was played in Ramanad Sagar's popular TV serial Ramayana is his brother. In recent times, Gujarati drama film releases such as Little Zizou, Kevi Rite Jaish and Premji: Rise of a Warrior were positively received by audiences. Gujarati TV serials which showcase the traditional culture and lifestyle have made a prominent place in India. Comedy actors such as Paresh Rawal, Sarita Joshi, Urvashi Dholakia, Ketki Dave, Purbi Joshi, Disha Vakani, Dilip Joshi, Jamnadas Majethia, Deven Bhojani, Rashmi Desai, Satish Shah, Dina Pathak, Ratna Pathak Shah and Supriya Pathak have found a place in audience hearts and are presently the top actors on Indian television. Modern actors of Gujarati heritage who are more versatile include Darshan Pandya, Vatsal Seth, Avinash Sachdev, Esha Kansara, Shrenu Parikh, Amar Upadhyay, Viraf Patel, Ajaz Khan, Sameer Dattani,Karishma Tanna, Drashti Dhami, Disha Savla, Komal Thacker, Vasim Bloch, Parth Oza, Tanvi Vyas, Nisha Rawal, Karan Suchak, Jugal Jethi, Isha Sharvani, Pia Trivedi, Sanjeeda Sheikh Pooja Gor, Payal Rohatgi, Ravish Desai, Shefali Zariwala, and Shenaz Treasurywala. There are dedicated television channels airing Gujarati programs. Well known musicians include the internationally acclaimed Kalyanji-Anandji, Vasant Rai, pop star Alisha Chinai, Darshan Raval, Shekhar Ravjiani, Salim–Sulaiman, sons of Sadruddin Merchant who is veteran composer of the film industry, and ghazal singer Pankaj Udhas who is recipient of the Padma Shri. Famous sports icons of Gujarati heritage include Karsan Ghavri, Deepak Shodhan, Ashok Mankad, Ghulam Guard, Prince Aslam Khan, Rajesh Chauhan, Parthiv Patel, Yusuf Pathan, Irfan Pathan, Cheteshwar Pujara, Manpreet Juneja, Ajay Jadeja, Ravindra Jadeja, Chirag Jani, Munaf Patel, Axar Patel, Kiran More, Ian Dev Singh, and Sheldon Jackson. World renowned computer scientist and inventor of SixthSense, Pranav Mistry (Vice President of Research at Samsung), Sam Pitroda (Communication Revolution), and Indian physicist Vikram Sarabhai are Gujarati. Vikram Sarabhai is considered the "father of India's space programme", while Dr. Homi Jehangir Bhabha, a Parsi who is related to the Tata industrial family is the "father of India's nuclear science programme". Another well known Parsi pioneer Jamsetji Tata who founded Tata Group, India's biggest conglomerate company and devoted his life to four goals: setting up an iron and steel company, a world-class learning institution, a unique hotel and a hydro-electric plant, is the "father of Indian industry". ^ Jaffrelot, Christophe (9 May 2016). "Narendra Modi between Hindutva and subnationalism: The Gujarati asmita of a Hindu Hriday Samrat". India Review. Taylor & Francis Group. 15 (2): 196–217. doi:10.1080/14736489.2016.1165557. ^ a b Rehman, Zia Ur (18 August 2015). "With a handful of subbers, two newspapers barely keeping Gujarati alive in Karachi". Karachi: The News International. ^ Joel Millman (1998). The other Americans: how immigrants renew our country, our economy, and our values. Pennsylvania State University. p. 170. ISBN 9780140242171. Retrieved 28 February 2017. There are over half a million Gujarati in America today. ^ Michel, Patrick; Possamai, Adam; Turner, Bryan (20 April 2017). Religions, Nations, and Transnationalism in Multiple Modernities. Springer. p. 163. ISBN 9781137580115. ^ a b c "Gujaratis in Britain: Profile of a Dynamic Community". NATIONAL CONGRESS OF GUJARATI ORGANISATIONS (UK). Retrieved 4 February 2015. ^ Raymond Brady Williams (2001). An Introduction to Swaminarayan Hinduism. University Press, Cambridge. p. 208. ISBN 978-0-521-65279-7. Retrieved 5 February 2015. Temple building is a sign of the growth in numbers and the increased prosperity of the Gujarati immigrants...The two decades between 1950 and 1969 were a heady period of success for the Gujaratis of East Africa... Michael Lyon observed that the Gujaratis acquired a new role in the colonial economics of East Africa, and ultimately a tragic one. They became a privileged racial estate under British protection. The Indian population in Kenya increased from 43,625 in 1931 to 176,613 in 1962... More than 80 percent were Gujaratis. ^ "NHS Profile, Canada, 2011, Census Data". Government of Canada, Statistics Canada. Retrieved 4 February 2015. ^ "Census shows Indian population and languages have exponentially grown in Australia". SBS Australia. Retrieved 28 June 2017. ^ Bharat Yagnik. "Oman was Gujaratis' first stop in their world sweep". The Times of India. Retrieved 5 February 2015. Oman's capital Muscat was the first home for Gujarati traders away from the subcontinent. The Bhatia community from Kutch was the first among all Gujaratis to settle overseas — relocating to Muscat as early as 1507! The Bhatias' settlement in the Gulf is emphasized by Hindu places of worship, seen there since the 16th century. As historian Makrand Mehta asserts, "Business and culture go together." ^ Rita d'Ávila Cachado. "Samosas And Saris:Informal Economies In The Informal City Among Portuguese Hindu families". Retrieved 4 February 2015. The Hindus in Great Lisbon have similarities with Hindus in the United Kingdom: they are mostly from a Gujarati background and migrated from ex-colonial countries. Yet the colonial system they came from was mostly Portuguese, both in India and in East Africa... Nevertheless, a realistic estimate is that there are about 30,000 Hindus in Portugal. That includes Hindu-Gujaratis, who migrated in the early 1980s, as well as Hindu migrants from all parts of India and Bangladesh, who migrated in the late 1990s. 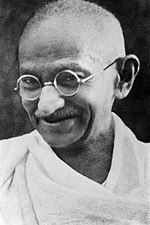 ^ M. K. Gandhi (2014). Hind Swaraj: Indian Home Rule. Sarva Seva Sangh Prakashan. ISBN 9789383982165. Retrieved 11 December 2015. ^ Minahan, James B. (2012). Ethnic groups of South Asia and the Pacific : an encyclopedia. Santa Barbara, Calif.: ABC-CLIO. p. 90. ISBN 978-1598846591. Retrieved 12 December 2015. Anti-British sentiment led to a strong Gujarati participation in the Indian independence movement. ^ Yagnik, Achyut; Sheth, Suchitra (2005). The shaping of modern Gujarat : plurality, Hindutva, and beyond. New Delhi: Penguin Books. ISBN 978-0144000388. Retrieved 12 December 2015. ^ Singh, A. Didar; Rajan, S. Irudaya (6 November 2015). Politics of Migration: Indian Emigration in a Globalised World. Routledge. p. 141. ISBN 9781317412243. Gujarat has a very strong history of migration. The ancient Gujaratis were known for their trading with other countries. The Mercantile caste of western India, including Gujarat, has participated in overseas trade for many centuries and, as new opportunities arose in different parts of the British Empire, they were among the first to emigrate... The Gujarati Diaspora community is well known for their legendary entrepreneurship. ^ Blank, Jonah (15 March 2002). Mullahs on the Mainframe: Islam and Modernity Among the Daudi Bohras. The University of Chicago Press. p. 47. ISBN 978-0-226-05677-7. Modern-day Mumbai is the capital of the state of Maharashtra, but until the creation of this state in 1960 the city has always been as closely linked to Gujarati culture as it has been to Marathi culture. During most of the colonial period, Gujaratis held the preponderance of economic and political power. ^ Raymond Brady Williams (15 March 1984). A New Face of Hinduism: The Swaminarayan Religion. Cambridge University Press 1984. p. 117. ISBN 978-0-521-25454-0. Retrieved 4 February 2015. ^ "Rubber Boom Raises Hope Of Repatriates". Counter Currents. Retrieved 16 February 2015. ^ "Gujarat should learn from Kerala - The New Indian Express". Retrieved 16 February 2015. ^ Peck, Amelia (2013). Interwoven Globe: The Worldwide Textile Trade, 1500-1800. The Metropolitan Museum of Art, New York. p. 15. ISBN 978-1-58839-496-5. Retrieved 4 February 2015. Of the Asian trading communities the most successful were the Gujaratis, as witnessed not only by Pires and Barbosa but by a variety of other sources. All confirm that merchants from the Gujarati community routinely held the most senior post open to an expatriate trader, that of shah-bandar (controller of maritime trade). ^ Farhat Hasan (2004). State and Locality in Mughal India: Power Relations in Western India, C.1572 - 1730. University Press, Cambridge. p. 42. ISBN 0-521-841 19-4. Retrieved 5 February 2015. Mulla Abdul Ghafur, one of the richest merchants in Surat, his son, Mulla Abdul Hai, was awarded the title of 'umdat-tud-tujjar' (lit. the most eminent merchant) by the imperial court. Shantidas Shahu, a powerful merchant of Surat, was gifted an elephant and robe by the emperor, both things being emblems of imperial sovereignty, that 'symbolized the incorporation of the recipient into his [King's] person as his subordinate, to act in future as an extension of himself. ^ Mawani, Sharmina; Mukadam, Anjoom A. (5 May 2016). Perspectives of female researchers : interdisciplinary approaches to the study of Gujarati identities. Mawani, Sharmina,, Mukadam, Anjoom A. Berlin. ISBN 9783832541248. OCLC 953734376. ^ Mehta, Makrand (1991). Indian merchants and entrepreneurs in historical perspective : with special reference to shroffs of Gujarat, 17th to 19th centuries. Delhi: Academic Foundation. pp. 21, 27. ISBN 978-8171880171. Retrieved 29 October 2015. The Gujarat region situated in the western part of India is known for its business activities since ancient times. The region has been agriculturally fertile and it also contains a long sea-coast enabling the merchants to undertake overseas trade. Thevenot held the Gujarati merchants in high esteem. Commending them for their skills in the currency business he states that he saw some 15000 banians in Ispahan, the capital of Persia operating exclusively as money-lenders and sharafs. He compared them with the Jews of Turkey and pointed out that they had their own residential settlements at Basra and Ormuz where they had constructed their temples. ^ Kalpana Hiralal. Indian Family Businesses in Natal, 1870 – 1950 (PDF). Natal Society Foundation 2010. Retrieved 4 February 2015. ^ Poros, Maritsa V. (2010). Modern Migrations Gujarati Indian Networks in New York and London. Palo Alto: Stanford University Press. p. 10. ISBN 978-0804775830. However, Gujaratis have been migrating as part of wide-ranging trade diasporas for centuries, long before capitalist development became concentrated in Europe and the United States. ^ Vinay Lal. "Diaspora Purana: The Indic Presence in World Culture". Retrieved 22 October 2015. Most historians, even those who have sought to move away from the narratives furnished by the framework of colonial knowledge, are unable to begin their narrative of the Indian diaspora before the nineteenth century, but the Gujaratis had justly established a diasporic presence in the early part of the second millennium. So renowned had the Gujaratis become for their entrepreneurial spirit, commercial networks, and business acumen that a bill of credit issued by a Gujarati merchant would be honored as far as 5,000 miles away merely on the strength of the community's business reputation. They traversed the vast spaces of the Indian Ocean world with confidence, and a Gujarati pilot guided Vasco da Gama's ship to India... Under Portuguese rule the Indian Ocean trading system went into precipitous decline, and not until the nineteenth century did the Gujarati diaspora find a new lease of life. Gujarati traders migrated under the British dispensation in large numbers to Kenya, Tanganyika, South Africa, and Fiji, among other places, and Mohandas Gandhi, himself a Gujarati, has recorded that the early political proceedings of the Indian community in South Africa were conducted in the Gujarati language. In East Africa their presence was so prominent that banknotes in Kenya, before the country acquired independence, had inscriptions in Gujarati. Khojas, or Gujarati Ismailis, flourished and even occupied positions as teachers and educators in Muslim countries around the world. ^ Seeing Krishna in America The Hindu Bhakti Tradition of Vallabhacharya in India and Its Movement to the West. McFarland Publishing. 2014. pp. 48, 49. ISBN 9780786459735. Retrieved 24 October 2015. Among Gujaratis, emigration from India has a long history that has also affected Pushtimargiyas. As a seacoast mercantile population, the migration patterns of Gujaratis are ancient and may extend back over two millennia. ^ Ghulam A. Nadri (2009). Eighteenth-Century Gujarat: The Dynamics of Its Political Economy, 1750-1800. p. 193. ISBN 978-9004172029. ^ Eskild Petersen; Lin Hwei Chen; Patricia Schlagenhauf-Lawlor (14 February 2017). Infectious Diseases: A Geographic Guide. Wiley. p. 8. ISBN 978-1-119-08573-7. ^ "Gujarat & India Same, Different But Same". outlookindia.com. A historically mercantile culture, widespread influence of Jainism, diluted casteism and an intrinsic irreverence makes society and polity in Gujarat different from other Indian states. Centre-right in their economic leaning, people here naturally gravitate towards leaner governments with high standards of governance... Absence of local rulers’ courts meant that trade-mercantile guilds ran affairs and administration. The kind of socio-cultural influence that pervaded the feudal kingdoms of Rajasthan etc was absent in Gujarat. The trade guilds were akin to the influential mercantile guilds of Belgium and the Netherlands, which contributed to making the Dutch world leaders in finance. In Gujarat, this cascaded into a strong entrepreneurial culture. As the English philosopher Bertrand Russell puts it, governments which consist of mercantilists tend to be more prudent in running the administration. ^ Jacobsen, Knut A. (11 August 2015). Routledge Handbook of Contemporary India. Routledge. ISBN 9781317403586. ^ "Going global". The Economist. 19 December 2015. Whereas one religion, Protestantism, has often been associated with the rise of Anglo-Saxon capitalism, Gujarati capitalism was much more a fusion of influences. Ethnic and religious diversity became a source of strength, multiplying the trading networks that each community could exploit. Pragmatism and flexibility over identity, and a willingness to accommodate, perhaps inherited from the mahajans, are strong Gujarati traits, argues Edward Simpson of the School of Oriental and African Studies at the University of London. Gujaratis have been adept at remaining proudly Gujarati while becoming patriotically British, Ugandan or Fijian—an asset in a globalised economy. ^ Sundar, Pushpa (24 January 2013). Business and Community: The Story of Corporate Social Responsibility in India. SAGE Publications India. ISBN 9788132111535. The merchants were organized into mahajans or guilds with hereditary seths. A mahajan could include merchants of different religions and there was no strict segregation of religious, social, and occupational functions. ^ Malik, Ashish; Pereira, Vijay (20 April 2016). Indian Culture and Work Organisations in Transition. Routledge. ISBN 9781317232025. He found that Gujaratis are highly family-oriented valuing family network and highly familial. They are also spiritualistic, religious and relationship oriented, attaching importance to co-operation. They are accepted to be materialistic. Panda, on the basis of empirical evidence, has named the society as 'collectivist familial (clannish) society'. Further, Gujarati society is found to have a high social capital. The dominant cultural characteristics identified from this study, which are essentially 'familial', 'co-operative' and 'non-hierarchical' (democratic) are consistent with Joshi's findings. ^ "Gujarat Religion Census 2011". Census of India, 2011. The Registrar General & Census Commissioner, India. ^ Anjali H. Desai. India Guide Gujarat. India Guide Publications. ISBN 9780978951702. ^ Cordell Crownover (5 October 2014). Ultimate Handbook Guide to Muscat : (Oman) Travel Guide. Retrieved 4 February 2015. As an important port-town in the Gulf of Oman, Muscat attracted foreign tradesman and settlers, such as the Persians, the Balochs and Gujaratis. ^ Ababu Minda Yimene (2004). An African Indian Community in Hyderabad: Siddi Identity, Its Maintenance and Change. pp. 66, 67. ISBN 978-3-86537-206-2. Retrieved 4 February 2015. Some centuries later, the Gujarati merchants established permanent trading posts in Zanzibar, consolidating their influence in the Indian Ocean... Gujarati Muslims, and their Omani partners, engaged in a network of mercantile activities among Oman, Zanzibar and Bombay. Thanks to those mercantile Gujarati, India remained by far the principal trading partner of Zanzibar. ^ Paul R. Magocsi (1999). Encyclopedia of Canada's Peoples. University of Toronto Press. p. 631. ISBN 978-0-8020-2938-6. Retrieved 4 February 2015. Gujarat's proximity to the Arabian Sea has been responsible for the ceaseless mercantile and maritime activities of its people. Through the ports of Gujarat, some of which date back to the dawn of history, trade and commerce flourished, and colonizers left for distant lands. ^ Chidanand Rajghatta. "Global Gujaratis: Now in 129 nations". The economic times. Retrieved 21 October 2015. A lot of the spread worldwide took place after a pit-stop in East Africa, right across the sea from Gujarat. When Idi Amin turfed out some 100,000 Indians (mostly Gujaratis) from Uganda in 1972, most of them descended on Britain before peeling off elsewhere. ^ Premal Balan & Kalpesh Damor. "Thanks to NRIs, 3 small Gujarat villages each have Rs 2,000cr bank deposits". the times of india. Retrieved 26 October 2015. No wonder bank hoardings flashing interest rates for NRI deposits (up to 10%) is a common sight in these villages. "Some villages in Kutch like Madhapar and Baladia have very high NRI deposits. To the best of our knowledge, this is the highest in the country," said K C Chippa, former convener of the State Level Banker's Committee (SLBC) Gujarat. Between them, Madhapar, Baladia and Kera have 30 bank branches and 24 ATMs. ^ Piyush Mishra. "NRI deposits in Gujarat cross Rs 50K crore mark". the times of India. Retrieved 26 October 2015. Gujaratis form 33% of the Indian diaspora and Gujarat is among the top five states in the country in terms of NRI deposits. RBI data shows there was a little over $115 billion (about Rs 7 lakh crore) in NRI accounts in India in 2014-15, with Gujarat accounting for 7.78% of the kitty. ^ Fernandez-Kelly, Patricia; Portes, Alejandro, eds. (1 July 2015). The State and the Grassroots: Immigrant Transnational Organizations in Four Continents. Berghahn Books. p. 99. ISBN 9781782387350. Retrieved 26 October 2015. ^ "JAVED MIANDAD: profile". karismatickarachi. Retrieved 4 February 2015. ^ "Chapter 9 - Charity Galore in Journal of Informal Religious Meetings, vol. 5(8), Oct/Nov 2004". ^ Khaled Ahmed (23 February 2012). "Gujarat's gifts to India and Pakistan". The Express Tribune. Retrieved 5 February 2015. ^ "The Gujaratis of Pakistan – By Aakar Patel". Retrieved 4 February 2015. ^ "Yearbook of Immigration Statistics: 2013 Supplemental Table 2". U.S. Department of Homeland Security. Retrieved 18 June 2014. ^ "Yearbook of Immigration Statistics: 2012 Supplemental Table 2". U.S. Department of Homeland Security. Retrieved 5 July 2013. ^ "Yearbook of Immigration Statistics: 2011 Supplemental Table 2". U.S. Department of Homeland Security. Retrieved 5 July 2013. ^ "Yearbook of Immigration Statistics: 2010 Supplemental Table 2". U.S. Department of Homeland Security. Retrieved 5 July 2013. ^ Khandelwal, MS (1995). The politics of space in South asian Diaspora, Chapter 7 Indian immigrants in Queens, New York City: patterns of spatial concentration and distribution, 1965–1990 - Nation and migration: - books.google.com. Philadelphia, USA: University of Pennsylvania. p. 179. ISBN 978-0-8122-3259-2. Retrieved 20 June 2015. ^ Rangaswamy, Padma (2007). Indian Americans (2007 Hardcover ed.). New York: Chelsea House. p. 55. ISBN 9780791087862. ^ Virani, Aarti. "Why Indian Americans Dominate the U.S. Motel Industry". The Wall Street Journal. Retrieved 2 February 2015. ^ HIRAL DHOLAKIA-DAVE (18 October 2006). "42% of US hotel business is Gujarati". The Times of India. Retrieved 5 February 2015. Gujaratis, mainly Patels, now own 21,000 of the 53,000 hotels and motels in the US. It makes for a staggering 42% of the US hospitality market, with a combined worth of $40 billion. ^ Ashish Chauhan (15 August 2016). "Air India launches Ahmedabad to Newark flight". The Times of India. Retrieved 8 September 2016. ^ Drew Joseph (14 August 2010). "Bera Hopes to Wipe Out Lungren Despite GOP Wave". San Francisco Chronicle. Retrieved 22 September 2010. ^ Nuzzi, Olivia (5 February 2018). "White House Official Called Trump 'a Deplorable'". New York. ^ "FIVE INDIAN AMERICANS AMONG FORBES 400 RICHEST". global gujarat news. Retrieved 6 February 2015. Next comes Romesh T. Wadhwani (No. 250), Founder and Chairman, Symphony Technology Group, with a net worth of $1.9 billion. Landing in the US with only a few dollars in his pocket, he developed business software firm Aspect Development. Today his portfolio includes more than 10 different enterprise software companies. ^ "Top 10 Richest Gujarati in the India". global gujarat news. Retrieved 23 February 2018. Romesh Wadhwani is the chairman and CEO of Symphony Technology Group, which brings in $2.5 billion in annual revenues. In January 2017 the firm sold MSC Software to Swedish company Hexagon for $834 million. After graduating from the Indian Institute of Technology, he went to Carnegie Mellon and received a Ph.D. in 1972 in electrical engineering. ^ "Savan Kotecha, Songwriter". ofindianorigin.co.uk. Archived from the original on 3 November 2010. Retrieved 24 October 2015. I come from a pretty traditional Gujarati family and that made getting into the music business pretty tricky. My parents like most Indian parents, wanted me to go to Uni and be a Doctor or Lawyer. That meant I was on my own for the most part as far as figuring out how to 'make it'. It also gave me something to prove which made me work extra hard. ^ Shastri Ramachandaran. "India has much to learn from Britain and Germany". dnaindia.com. Retrieved 22 October 2015. Britain places high value on the power of commerce. After all, its political and military dominance when Britannia ruled the waves was founded on its trading power. The Gujaratis know this better than many others, which explains their prosperity and success in the UK. ^ Chitra Unnithan (23 May 2012). "Family is key to success of Gujarati businessmen in Britain". The Times of India. Retrieved 4 February 2015. British Gujaratis were also more successful than other minority communities in Britain because they had already tasted success in Africa. The book also says that Gujarati Hindus have become notably successful public citizens of contemporary, capitalistic Britain; on the other hand, they maintain close family links with India. "British Gujaratis have been successful in a great variety of fields. Many younger Gujaratis took to professions rather than stay behind the counter of their parents' corner shops, or they entered public life, while those who went into business have not remained in some narrow commercial niche," says the book. ^ Sudeshna Sen (8 January 2013). "How Gujaratis changed corner shop biz in UK". The Economic Times. Retrieved 4 February 2015. "What most people don't get is that those who took the Arab dhows in the 17th and 18th century to leave their villages and set up life in an alien land were already an entrepreneurial and driven minority, in search of a better life. They communicated that hunger to their children," says Raxa Mehta, director at Nomura, based in Tokyo and first generation child of Kenyan Indian parents. So it doesn't surprise the Gujaratis that they did well in Britain – it only surprises the Brits and Indians. The Gujaratis are a trader community. As Manubhai says, they always left the fighting to the others. If there's one diaspora community that East African Asians model themselves on, it's the Jews. Except of course, the Jews get more publicity than they do. ^ "London's Gujarati Christians celebrate milestone birthday". www.eauk.org. ^ "Jain Samaj Europe". Archived from the original on 23 January 2015. ^ "Shree Kutch Leva Patel Community (UK)". sklpc.com/. ^ Eliezer Ben Rafael, Yitzhak Sternberg (2009). Transnationalism: Diasporas and the Advent of a New (Dis)order. p. 531. ISBN 978-90-04-17470-2. Retrieved 4 February 2015. ^ "Shree Maher Samaj UK". maheronline.org/. Retrieved 3 April 2015. ^ "Gujarati Arya Kshatriya Mahasabha-UK". gakm.co.uk/?p=about. Retrieved 3 April 2015. ^ Gujarati Muslim Marriage, a dedicated service to assist Gujarati Muslims to marry within the community. ^ Lum, Kathryn (16 October 2014). "The rise and rise of Belgium's Indian diamond dynasties". The Conversation. ^ "Toronto Garba: North America's Largest Raas-Garba". www.torontogarba.com. Retrieved 29 June 2018. ^ Al Noor Kassum (2007). Africa's winds of change : memoirs of an international Tanzanian. London: I.B. Tauris. ISBN 978-1-84511-583-8. Retrieved 6 February 2015. ^ Versi, Salima. "Make This Your Home: The Impact of Religion on Acculturation: The Case of Canadian Khoja Nizari Isma'ilis from East Africa". Queens University. Retrieved 5 February 2015. ^ Ajit Jain. "'Gujarati diaspora integral to state's success'". theindiandiaspora.com. Retrieved 22 October 2015. According to him "It was a very warm discussion. PM Modi knows Canada well because we have been such active participants in Vibrant Gujarat for over 18 years now. He also knows very well how strong the Gujarati diaspora is in Canada. It may be up to one quarter of all the Indo-Canadians in this country, and so their success has been part of Gujarat's success." And "the prime minister (of India) recognizes that," Alexander stated emphatically. ^ "Executive Profiles - Group Heads | TD Bank Group". www.td.com. Retrieved 29 June 2018. ^ "Zain Verjee – Atlanta, Georgia". alusainc.wordpress.com. Retrieved 7 December 2015. Verjee also has produced successful radio campaigns spreading awareness of HIV/AIDS, road safety and violence against women. Her community efforts include work with Street Children and with Operation Smile. Verjee received her undergraduate degree in English from McGill University in Montreal and studied at York University in Canada. She speaks Gujarati, Kiswahili and conversational French. ^ "The Velshi Exchange". alivelshi.com. Retrieved 29 June 2018. ^ "Arif Virani wins in Parkdale-High Park | The Star". thestar.com. Retrieved 29 June 2018. ^ "Canada's Prime Minister Stephen Harper is not a real Evangelical Christian". the nonconformer.wordpress.com. Retrieved 7 December 2015. Jaffer, who is an Ismaili Muslim of Gujarati origin, became Canada’s youngest non-white MP at the age of 25 in 1997. He served four terms till his loss in the 2008 parliamentary elections. ^ "The Genius of Naheed Nenshi". The Parallel Parliament. 19 February 2014. But there was more. In two words, he was challenging and electric. And his own background is so varied as to make him unique. He’s an east Indian who lived in Tanzania prior to coming to Canada. He’s slightly over 40 years of age, a Muslim, has a degree from Harvard, and just happened to best three solid status quo challengers to win Calgary’s top job. Seated together at the front of that assembly room, I realized it was the very mystique about him that caused people to look at things in a new fashion. ^ "Our Team: Prashant Pathak - ReichmannHauer Capital Partners". www.rhcapitalpartners.com. Retrieved 29 June 2018. ^ Parth Shastri. "US researcher looks for Gujarati influence in Kenya and East Africa". the times of india. Retrieved 28 October 2015. During British ascendancy, the early Gujarati-speaking traders were predominantly Muslims—Khoja, Bhora, and Ithna Asheri. They were quickly followed by Patel, Lohana, Bhatia and Oshawal. "Community was a major factor. It both energized Indian identity and simultaneously prevented Indians from coming together as a political whole except in times of dire crisis," Misha says. ^ "Forbes India Magazine – Experiences of the Indian Diaspora in Africa". 26 August 2009. ^ "The rise and rise of Kenya's silent billionaires at NSE". Business daily Africa. Retrieved 7 February 2015. Baloobhai Patel, a director of Pan Africa Insurance, is invariably listed as one of the largest individual shareholders of more than 10 companies on the Nairobi bourse. The 75-year-old has major interests in Pan Africa Insurance, Barclays, Bamburi, DTB, Mumias Sugar, and Safaricom currently valued at Sh2.4 billion. ^ "Vimal replaced on Forbes list of Africa's 50 richest people". Business daily Africa. Retrieved 7 February 2015. ^ Saeed Khan. "Gujaratis brought glory to East Africa". Times of India. Retrieved 7 February 2015. Historian Makrand Mehta credits Gujaratis' contribution for the success of this project. He describes how A M Jeevanji, a Dawoodi Bohra from Kutch, got labour contract for the project. ^ Bharat Yagnik. "Non-Resident Gujaratis build Rs 100cr hospital in Nairobi". the times of India. Retrieved 1 November 2015. Even as the India-Africa Forum Summit 2015 kicked off celebrating Indo-Africa ties, the Kutchi Leuva Patel Samaj settled in Kenya is building a super-speciality charitable hospital at the cost of Rs 100 crore in Nairobi to gift a state-of-art healthcare facility to locals...Lakshman Raghwani, a Nairobi-based contractor and community leader, said the community is running a school for 22 years in Nairobi that has over 3,000 Indian and Kenyan students. "The hospital is an extension of our engagement with the local community.Two other major hospitals on national level - MP Shah Hospital in Nairobi and Agha Khan Hospital in Mombasa - also have Gujarati connection," he said. ^ Bharat Yagnik. "From assistant priest to Kenya's steel tycoon". the times of India. Retrieved 1 November 2015. He has earned the sobriquet 'Guru' amongst his peers in Kenya. With a net worth of $650 million, Gujarati steel tycoon Narendra Raval (53) of Devki Group is one of the wealthiest businessmen of Kenya today. Narendra Raval, through his pragmatic business ideologies and philanthropy, aims to transform the once-hostile perception of Africans about Indian businessmen. His company employs 98% staff from local Kenyan and African populace and also runs many orphanages and schools for the underprivileged. ^ "Ugandan Asians are part of Britain's secret weapon for success". spectator.co.uk. Archived from the original on 10 November 2015. Retrieved 28 October 2015. In 1997, Ugandan President Museveni invited the displaced Asians to return home. And while some returned to sort out their affairs, very few went back for good. ^ "Out of Africa: Thousands of Ismaili Muslims expelled from their African homelands in the 1970s have thrived in Canada". www.canada.com. Calgary Herald. Archived from the original on 17 January 2016. Retrieved 28 October 2015. Through the efforts of the Aga Khan, other countries agreed to take in the refugees, and they were scattered over the world. Britain took in 20,000, the U.S. took 50,000, and 75,000 came to Canada... Ladha said Canada's role in taking in the refugees has earned the praise of the Aga Khan for its treatment of refugees and its multiculturalism. "The Aga Khan is a great admirer of Canada's multicultural policies," said Ladha. As a result, he's putting $4 million toward a global centre for pluralism in Ottawa, with the Canadian government providing $3 million..
^ Anna Greenwood; Harshad Topiwala (2015). Indian Doctors in Kenya, 1895-1940: The Forgotten History Cambridge Imperial and Post-Colonial Studies Series. Palgrave Macmillan. p. 25. ISBN 9781137440532. The Gujaratis comprised a large number of the traders drawn from the Western Indian port province of Gujarat (including Kutch) who had had long historical trading links with Zanzibar. Their presence meant that from very early on Zanzibar became demographically colonised by a religiously and ethnically diverse Gujarati speaking population of Ismaili Khojas, Bhoras, Suni Memons, Hindu Vaniyas and the Parsis. Frustratingly for historians this group of immigrants left few records, but it is widely agreed that they were the ancestors of the communities of Indian traders that the British encountered when they arrived in Zanzibar and the East Coast of Africa at the end of the nineteenth century. ^ Robin David (4 July 2010). "Rainbow Nation's colourful Indians". Times of India. Retrieved 5 February 2015. Gujaratis of Durban, who came to South Africa mainly from Surat and Saurashtra, have gone a step further and are keeping their unique Gujarati identity alive as well. Most of them arrived as traders soon after the first Indian labourers were brought in to work on sugarcane fields in the 1860s and have carved out a unique niche for themselves. ^ "Timeline". Archived from the original on 6 June 2011. Retrieved 24 November 2011. ^ "Ahmed Timol | South African History Online". Sahistory.org.za. Retrieved 28 August 2013. ^ "Yusuf Dadoo: A Biography". sahistory.org.za. Retrieved 5 February 2015. ^ "Indian-origin anti-apartheid activist Ahmed Kathrada pays tribute to Nelson Mandela". The Economic Times. 6 December 2013. Retrieved 5 February 2015. ^ "South African leader of Indian origin dead". The Hindu. Retrieved 6 February 2015. ^ MARK HAYES. 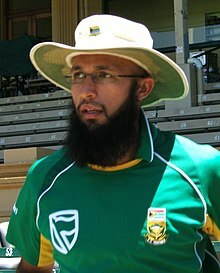 "The many faces of top South African batsman Hashim Amla". Archived from the original on 8 February 2015. Retrieved 5 February 2015. His parents are South African-born, but his grandparents were indentured workers from Surat -- and the family still occasionally speaks Gujarati from that western Indian region. ^ Willem Floor. "The Persian Gulf: Muscat – City, Society and Trade". Mage Publishers. Retrieved 5 February 2015. Muscat, the capital city of present day Oman, has had a long, and colorful history as a typical Indian Ocean port at the mouth of the Persian Gulf. International trade brought about a rich mix of various ethnic and religious groups including, besides Arabs, Africans, Baluchis, Mekranis, Sindis, Gujaratis, Persians and many others. At the turn of the twentieth century fourteen languages could be heard spoken in the city. ^ Khalid M. Al-Azri (2013). Social and Gender Inequality in Oman: The Power of Religious and Political Tradition. Routledge. p. 50. ISBN 978-0-415-67241-2. Retrieved 5 February 2015. Hindus had settled in Oman by the sixteenth century, and from at least the early nineteenth century Omani commerce and trade has been conducted by Hindu Banyans of Bhatia caste deriving from Kutch in Gujarat. ^ Hugh Eakin (14 August 2014). "In the Heart of Mysterious Oman". The New York Review of Books. Retrieved 5 February 2015. ^ Bharat Yagnik (3 January 2015). "Oman was Gujaratis' first stop in their world sweep". The Times of India. Retrieved 5 February 2015. ^ Marc Valeri (2009). Oman : politics and society in the Qaboos state. London: C. Hurst. p. 42. ISBN 978-1-85065-933-4. Retrieved 5 February 2015. One of these families is another Banyan one, known today as Khimji, whose ancestor came to Oman around 1870 from Gujarat. The family business grew during the Second World War, when it became the Sultan's most important contractor: the Khimji group was the exclusive supplier of the royal palace, and was granted the monopoly and distribution of food products in the Dhofar region. ^ Runa Mukherjee Parikh (11 May 2013). "World's only Hindu Sheikh traces his roots to Gujarat". The Times of India. Retrieved 5 February 2015. "We see achievements as milestones in the quest for excellence. We just want to be the best," says the 77-year-old tycoon, Kanaksi Khimji. Not sales and volumes, Khimji believes that the most important measure of success for his family's business is how far it has helped advance the national development plans laid out by Oman's Sultan Qaboos bin Said. In fact, Khimji with his Indian roots was one of the first to embrace Omanisation, a directive to train and empower Omani professionals. Such a rare honour makes Khimji the most distinguished Indian in this Middle Eastern country. ^ Alpers, Edward A. (31 October 2013). The Indian Ocean in World History. Oxford University Press. p. 106. ISBN 9780199721795. Gujarati merchants enjoyed a special place in the political economy of an emerging Omani Empire in the Western Indian Ocean, while as British-protected subjects they became the advance guard of British imperial presence in both the Gulf and eastern Africa north of the Portuguese possessions. Already by this time Omani customs collection, which was farmed out on five-year contracts to the highest bidder, was in the hands of a Kachchhi Hindu trader named Mowjee Bhimani whose family maintained control of the Masqat farm into the 1840s. ^ "Muscat Early History". bhatia mahajan. Retrieved 5 February 2015. ^ Hoerder, Dirk (2014). Migrations and Belongings. Harvard University Press. ISBN 9780674281318. The Western trade had, for example, led to settlement of merchants from the Gulf of Kutch and from Jamnagar in Zanzibar. In view of local hostility to intermingling, the merchants brought in wives, and a community emerged by 1860s. Its five to six thousand Hindus and Muslims fragmented, however, along ethnoreligious and occupational lines: Baluchi as soldiers of the Omani sultan, Memons from Sind in shipping and fishing, Parsi merchants, Hindu trading castes - Baniyas, Bhatias, Lohanas, and Shia Muslims, as well as Daudi Bohoras, Ismaili Khojas, Isthnasteris, and Goan Catholics. Ethnoreligious-professional traditions framed agency: Hindus usually returned when they had accumulated savings and wealth, whereas Muslims stayed and formed families... In the frame of dependencies between colonizer and colonies, the Gujarati enclave, protected by the Omani sultanate, did in the 1870s, become a conduit for British influence and, over time for British ascendancy. 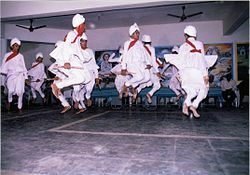 Distinct vertical links of each of the South Asian ethnoreligious groups to the British in Mumbai hindered horizontal Indian-cultured homogenization in the community. Mumbai's commercial expansion resulted in increased Gujarati in-migration, and Gujarati became the community's lingua franca. The privileged and thus distinct status granted by the Omani sultanate prevented indigenization. ^ Prabhune, Tushar (27 December 2011). "Gujarat helped establish Islam in SE Asia". Ahmedabad: The Times of India. ^ a b "PressReader.com - Connecting People Through News". www.pressreader.com. Retrieved 29 June 2018. ^ Jung, Jeffrey Aldford & Naomi Duguid ; photographs by Jeffrey Aldford & Naomi Duguid ; additional photographs by Richard (2005). Mangoes & curry leaves culinary travels through the great subcontinent. New York: Artisan. p. 14. ISBN 9781579655655. Retrieved 24 October 2015. ^ Dhwani Talati-Padiyar (8 March 2014). TRAVELLED, TASTED, TRIED & TAILORED: Food Chronicles. Lulu publishers. p. 76. ISBN 9781304961358. Retrieved 24 October 2015. ^ Zahir Janmohamed. "Butter Chicken in Ahmedabad". nytimes. Retrieved 24 October 2015. But attitudes are changing, according to Mr. Dauwa. "More people, especially businessmen from China and Japan, are visiting Gujarat and many of them want non-vegetarian food," he said. "And also, Gujaratis are becoming wealthier, and when they live abroad they pick up nonvegetarian eating habits." ^ "Western Indian Food: An explosion of Flavour". mapsofindia. Retrieved 27 October 2015. ^ Hajratwala, Bhanu (2011). Gujarati kitchen : family recipes for the global palate. Bangalore: Westland. ISBN 9789380658490. ^ a b "10 Best Gujarati Recipes". ndtv.com. Retrieved 27 October 2015. ^ Darra Goldstein (2015). The Oxford Companion to Sugar and Sweets Oxford Companions Series. Oxford University Press. p. 358. ISBN 978-0199313396. ^ "Sitafal basundi". khana khazana. Retrieved 25 October 2015. ^ Passing on the Culture in the Diaspora: Inter-generational Communication of Cultural Identity Amongst Gujaratis in the USA. ProQuest. 2007. p. 113. ISBN 9780549413127. Retrieved 25 October 2015. ^ "Doodh Poha on Sharad Poonam". Flat Footed Foodies. Retrieved 25 October 2015. ^ Raymond Brady Williams (1984). A New Face of Hinduism: The Swaminarayan Religion. CUP Archive. pp. 170–. ISBN 978-0-521-27473-9. Retrieved 18 August 2014. ^ "Shrimad Rajchandra – A spiritual gem". www.rajsaubhag.org. Archived from the original on 25 August 2014. Retrieved 27 October 2015. ^ Soni, vandana (2014). "A Translation of Jhaverchand Meghani's Nontranslated Folk Tales from Gujarati into English with a Critical Evaluation" (PDF): 484. ^ "Shankar Chaudhary". Facebook. Retrieved 23 October 2015. ^ "Sohrab Modi (1897–1984)". IMDb. Retrieved 6 February 2015. ^ "Asha Parekh – Memories". Cineplot.com. 28 March 2011. Retrieved 11 September 2011. ^ "Sanjeev Kumar had no ego, Ashok Kumar had a feminine voice". rediff.com. Retrieved 6 February 2015. People think from my surname Varma that I am Punjabi. But I belong to Kutch so I speak Gujarati and Kutchi. Sanju and I got along well. We spoke in Gujarati on the sets and we ate the same kind of food. ^ Film World. T.M. Ramachandran. 1973. p. 11. Retrieved 27 October 2010. ^ "Vadodara born actor Farooq Sheikh dies of heart attack". Desh Gujarat. Retrieved 6 February 2015. ^ "Mehtab-biography". cinegems.in. Cinegems.in. Archived from the original on 25 December 2014. Retrieved 25 December 2014. ^ "Shreedatt Vyas: profile". Facebook. Retrieved 6 February 2015. ^ "The Alyque Padamsee brand of life". The Times of India. Retrieved 23 January 2015. I was born into riches: Ours was a Kutchi business family. My father, Jafferseth, owned 10 buildings and also ran a glassware business. My mother, Kulsumbai Padamsee, ran a furniture business. Anything I wanted was there for the asking. We were eight children in all but I, being born after three daughters, was pampered most. Among Gujarati families, it was only the Padamsees and the royal house of Rajpipla. At school, I learnt to speak in English. Later, our parents learnt the language from us. All that I am today is because of what I learnt at school. Miss Murphy, who ran the school, was an inspirational figure for me. ^ "ISMAIL MERCHANT: IN MEMORY". roger ebert. Retrieved 6 February 2015. ^ "Gujarati music needs to get globalized: Jaykar Bhojak". Times of India. Retrieved 7 February 2015. ^ "When yesterday blessed today". IndiaGlitz. ^ Nevile, Pran (2006). Lahore : a sentimental journey. New Delhi, India: Penguin Books. p. 89. ISBN 978-0143061977. ^ Jai Arjun. "Dry well, foul smell - on Ketan Mehta's excellent Bhavni Bhavai". ^ Eleanor Mannikka. "Bhavni Bhavai (1980)". New York Times. ^ "Bhavni Bhavai critics/reviews". Archived from the original on 20 December 2014. Retrieved 20 December 2014. ^ Amrita Mulchandani. "Looks matter the most in TV: Darshan Pandya". the times of india. Retrieved 3 April 2015. Looking dapper in the cool denims and hooded jacket, actor Darshan Pandya managed to turn quite a few heads as he struck poses at the River Front during his recent trip to Ahmedabad. The actor, who came into the limelight for his impressive performance in his debut TV show 'Aapki Antara' has been in the news for his recent endeavour in 'Kya Huaa Tera Vaada' where he played Vineet until recently. In town for a personal visit, Darshan says, "I have come here for few days as my parents and sister live here. I watched a film and enjoyed some lovely food in various restaurants in the city." ^ "Huma Qureshi tweets for Vatsal Sheth". Times of India. Retrieved 6 February 2015. Gujarati actor Vatsal Sheth is back on the small screen with a bang! ^ "TV stars' Navratri musings". Times of India. Retrieved 7 February 2015. ESHA KANSARA: Being a Gujarati, Navratri is a festival that's very close to my heart. I simply love the vibrancy this festival brings with it. ^ IANS. "Shrenu Parikh: I travelled in trains without ticket!". Retrieved 29 June 2018. ^ Baker, Steven. ""My work has gone to another level" – Sammir Dattani". Bollyspice.com. Retrieved 23 January 2015. Your family is Gujarati, you were born and brought up in Bombay, and you have worked in Hindi, Kannada and Tamil cinema, so what languages do you speak? Well I speak Kannada. I speak Gujarati, Hindi of course, English of course, and a bit of Marathi and Telugu. ^ "Upen Patel proposes Karishma Tanna inside Bigg Boss, her craze is rising outside!". Retrieved 6 February 2015. ^ Amrita Mulchandani. "Link-up rumours don't really bother me: Drashti Dhami". The Times of India. Retrieved 24 January 2015. Chirpy, Dhrasti Dhami exudes great energy not just on the small screen, but insists she is the same in real life too. Dhrasti has a strong Gujarat connect and is proud of her roots. "I am a very proud Gujarati. I have lots of relatives in Surat, but it's been quite some time since I have been there. I came to Ahmedabad as a child, but haven't visited the city for some time," she says. ^ Ano Patel. "Gujaratis take the lead on prime time TV". Times of India. Retrieved 6 February 2015. Hometown: Kutch. As the nagging wife Bobby in Neeli Chhatri Wale, Disha Savla has made quite an impression, and shares screen space with Yashpal Sharma. The actress who hails from Kutch has been part of a number of plays in Mumbai and has also done a Gujarati show on TV. Making her debut on Hindi TV, she says, "The Gujarati show has prepared me for taking this next step. It is a very different concept so I hope this show clicks with the audience." ^ "Komal Thacker: profile". Facebook. Retrieved 3 April 2015. ^ "Vasim Bloch: profile". Facebook. Retrieved 7 February 2015. ^ "Parth Oza: Artography". parthoza.com. Retrieved 7 February 2015. ^ Ano Patel. "Gujaratis take the lead on prime time TV". Times of India. Retrieved 6 February 2015. Karan Suchak Hometown: Ahmedabad. After playing character roles in Ek Hazaaron Mein Meri Behna Hai, Savitri and Pavitra Rishta, Karan shot to fame as Dhrishtadyumna in Mahabharat. Now playing Raja Vikramaditya in Singhasan Battisi, Karan says, "I was born in Ahmedabad and I am a Gujarati. It's only been a few months for me in this industry and it has been a busy journey, I hope it remains that way." ^ "Jugal Jethi". Facebook. Retrieved 8 March 2015. ^ "Isha Sharvani: I call myself a global Gujarati". Times of India. Retrieved 7 February 2015. Actress-danseuse Isha Sharvani who was in Vadodara to perform at a mega art and culture festival, says, "My mother is a Gujarati and I have very fond memories of Gujarat. ^ "New kid on the block: Pia Trivedi". stargold.in. Archived from the original on 6 February 2015. Retrieved 24 January 2015. ^ Anil Mulchandani. "Shining stars". india today. Retrieved 6 February 2015. ^ "Shenaz Treasurywala". kaneesha.com. Retrieved 6 February 2015. Shenaz Treasurywala is a famed Indian model, actress, VJ and a Travel writer. Born on 29th June, 1981 in Mumbai, Shenaz Treasurywala belongs to a middle class Gujarati speaking Parsi family. ^ Abhimanyu Mishra. "Darshan Rawal enters the final four on reality show". The Times of India. Retrieved 16 April 2015. Darshan Rawal has been quite a sensation with his signature style singing and an adorable personality which has won him many fans. ^ "Not thought of acting as of now: Shekhar". Times of India. Retrieved 8 February 2015. I belong to Jamnagar but my mother has many friends in Ahmedabad. I miss eating ice-candies and listening to Gujarati folk music during Navratri. I want to travel to the interiors of Gujarat and some places in Kutch, and interact with the local musicians who compose on those rare musical instruments. What attracts me is the strong folk music heritage that Gujarat has kept alive after so many years. ^ "Cricketers have become too aggressive: Gavaskar". the times of India. Retrieved 19 November 2015. Sunil Gavaskar had the audience in splits when he said how he learnt Gujarati. "We had two Gujaratis, Ashok Mankad and Karsan Ghavri, in Mumbai team and others were Maharashtrians. Mankad and Ghavri used to murder Marathi so we said that we will learn Gujarati. 'Mane pan thodu Gujarati aavde che'," said Gavaskar to an amused audience. ^ "India / Players / Sheldon Jackson". espncricinfo.com. Retrieved 4 April 2015. ^ "Jamshedji Tata - Founder of TATA Industries". webindia123.com. Retrieved 29 June 2018. Wikimedia Commons has media related to Gujarati people.